We may find out what retired General Rick Hillier knew about the alleged abuse of detainees after they were handed over to Afghan prisons by Canadian soldiers when he testifies before the parliamentary committee today. Hillier is a former NATO forces commander and was Canadian Chief of Defense Staff until last year. In his recently released memoir, A Solider First, Hillier offers his take on the first headlines about detainee torture in 2007. Canada had no official policy on detainees when our government first sent troops to Afghanistan in 2002, he writes, and the “minuscule number” of prisoners wasn’t a major concern in the early days. When the fighting heated up in spring of 2006, our military started handing their captures over to American Coalition troops, and then the NDS, Afghanistan’s intelligence service. Not so, says Richard Colvin. As a Canadian diplomat, Colvin volunteered to go to Afghanistan in 2006, after the death of Glyn Berry. He stayed for 17 months. While working for the Department of Foreign Affairs, and later in the Canadian Embassy, Colvin visited detainees. He told the parliamentary committee that he sent numerous reports to Canadian Forces and Foreign Affairs, airing his concerns about who was being captured, and the horrific abuse most, if not all, of the detainees faced contrary to the Geneva Convention. Many were innocent locals, farmers and truck drivers, Colvin said. His reports were mostly ignored, until he was asked to stop putting them in writing in 2007. The government has attacked Colvin’s credibility and denied that the current government knew anything about torture. Peter MacKay called the opposition a bunch of “bobbleheads and muppets” during question period when Bob Rae asked about the government’s knowledge and action on the issue multiple times, in both official languages. MacKay’s continued response was to reference “the previous government” (and presumably his predecessor, Gordon O’Connor). 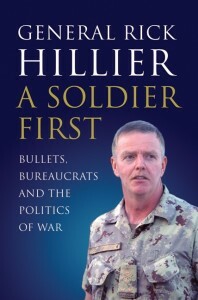 During the ten pages in his book Hillier devotes to the issue of detainee abuse, most of it is centralized around what a good job he believes many Canadian Forces soldiers did not killing the prisoners themselves. “We had all learned something from Somalia,” he writes repeatedly. Yes, we did. The Canadian Forces saw its budgets hacked to bits, its numbers drop, and the country’s pride in its image of the “peacekeeping” soldier suffer a critical blow. The Canadian Forces has changed dramatically since the death of a Somali teenager at the hands of two Canadian soldiers in 1993. An inquiry into that matter lasted four years, and never uncovered what the upper levels of government knew about the incident, or any attempt to cover it up. Only time will tell whether Hillier’s testimony, and that of others called to speak before the committee, will be any more revealing.